When I see grease and fat, condoms, tampons, tampon applicators, maxi pads, wipes, and other waste floating in the lake, it's upsetting. I, like you, am a recreational water user. I'm a Torontonian who explores the city’s waterways and visits the city’s beaches. I enjoy roaming the city by foot, bike, and when the Angus Bruce is in town, by boat. I love the feeling of jumping in and getting swallowed up by Lake Ontario’s sometimes shockingly cold water. I swim, paddle, boat, fish, and hopefully someday soon, I’ll surf and dive in this Great Lake. Because I feel connected to it, I inherently feel the responsibility for caring for this lake as much as many of you do. And even though I’ve worked for Waterkeeper for a couple of years, my first reaction to the sight of waste in the water is still a flurry of frustration. Why isn't the government doing anything about this? How is this legal? Isn't this a "world class city?" Don’t Blue Flag beaches mean the lake is clean? Why aren't rec water users told when their health is at risk? What is being done to change this? Cities around the world are desperate for a freshwater resource like Lake Ontario – why is this acceptable? These are the same questions many of our supporters ask, so I know I’m not alone. But working at Waterkeeper has taught me many things. One of which is the importance in staying calm and putting aside my frustration. Documenting what I see is crucial so we can prove that someone is responsible, and get the problem fixed. 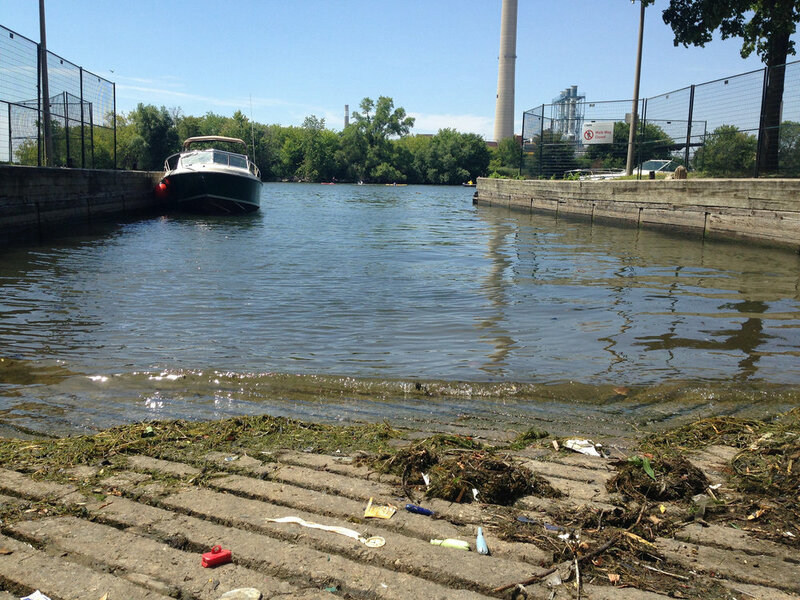 It seems so obvious: condoms and tampons floating in the lake obviously means there’s sewage in #mylakeontario. And yet one of the biggest struggles following a spill is proving that it happened. And once it's proved that it happened, proving that it’s something to be concerned about. And once it's proved that it’s a concern, proving someone is responsible. And once it's proved someone is responsible, getting it cleaned up. And once it's cleaned up, making sure that it never happens again. Without evidence – without proof – as Mark says, “It’s like a victimless crime.” Our recent work focusing on Toronto’s inner harbour is a good example. Along Toronto's inner harbour, underwater, there are nine combined sewer overflow (CSO) pipes that open directly into the lake. When there’s heavy rain, it’s not unusual for the pipes to get overwhelmed and wash sewage debris into the inner harbour. If you’re around the area, a pungent smell is sometimes noticeable too. Red markers indicate each combined sewer overflow in Toronto's harbour. The City says it doesn’t monitor sewage flowing into the harbour. There are no signs showing residents where those pipes are. And they’re underwater so of course, they’re very easily missed. By the time anyone notices the waste, it’s usually too late. Paddlers may already be in the water when they spot a condom floating by. And even though it’s been a dry summer, my Waterkeeper teammates and I are still finding sewage debris in the inner harbour. This is why we are sampling water through our Indiegogo campaign and with the support of Muskoka Brewery and Evergreen. This summer has been eye-opening for me. I’m constantly surprised by the number of people who deny Toronto has a sewage pollution problem, even when we show them photo after photo of condoms, tampon applicators, wipes, and waste floating around the harbour. No, the debris isn’t coming from boaters. And no, the debris isn’t washing in from the U.S.
I’m also surprised by the number of people willing to turn their backs on Lake Ontario. They write it off as a “working lake” or a “lost cause,” thinking that one bad sewage day means this Great Lake is worthless. That’s why I remind myself to stay calm. And to document what I see. Because facts will tell the story that we need to tell to save this lake. Document it. 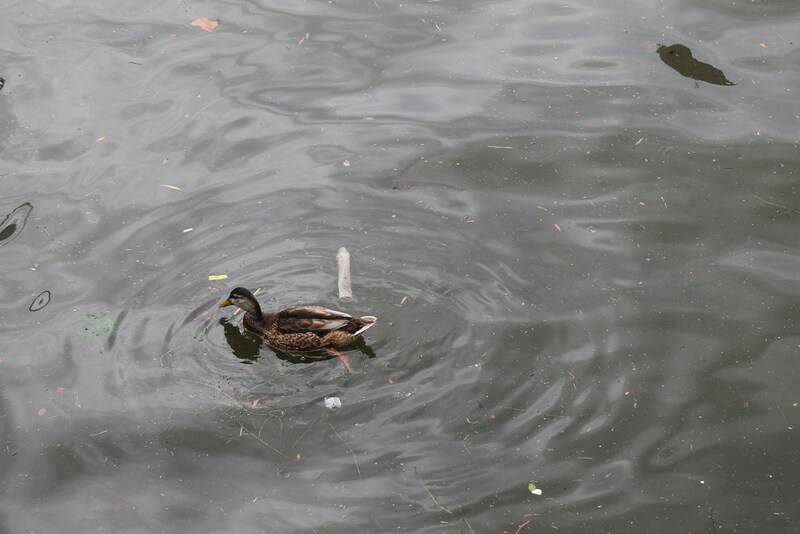 When you see sewage debris such as “flushable” wipes, condoms, feminine products (tampons, tampon applicators, maxi pads), hardened grease and fat, needles, or as we’ve seen, dead rats, ducks, and mice floating along the shoreline – take a photo and note when and where you took the photo. Report what you saw. If you live in Toronto, you can report to the city by calling *311. If you aren’t sure who to call, try the Ontario government spills hotline at 416-325-3000, or toll-free 1-800-268-6060. You can also share what you saw online and use the hashtag #mylakeontario. Having more eyes on the water (virtually and in reality) is a huge help to protecting the lake and everyone who enjoys it. Report any infection and illnesses. Over 36,000 Ontarians contract infections and illnesses from recreational water every summer. If you happen to get an infection in your eyes, ears, nose, or on your skin, please report it to your doctor and your local health unit. The number of people using Ontario waters has doubled in the last decade. It’s more important now than ever that our waters are swimmable and public health is protected.